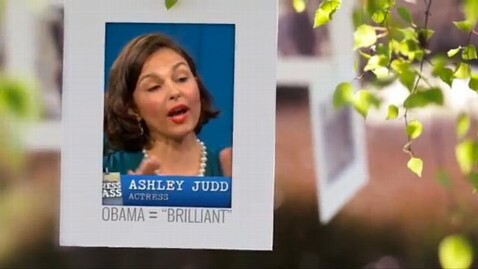 Actress Ashley Judd has not yet decided to run for Senate in Kentucky, but she's already the subject of an attack video posted online by a conservative super PAC American Crossroads. Judd has entertained the idea of running against Kentucky Republican Senate Minority Leader Mitch McConnell in 2014 but the Super PAC ad titled "Vote For Me, You Hillbillies" takes jabs at the politically active actress, making digs at her ability to lead and paint her as an Obama-following, radical, Hollywood liberal. "You know what this country needs?" a narrators voice sarcastically asks in the clip. "An independent voice…for Obama." The video then cuts to clips of Judd saying that she will " go wherever the president wants me to go, " mocking her ability to separate herself from the Obama-Biden ticket. The American Crossroads ad also uses Judd's own words to suggest she claims to hail from Tennessee rather than Kentucky. "And it just clicked…Tennessee is home," Ashley Judd says in a clip before the ad continues to show video of the actress referencing "hillbillies." Jonathan Collegio, spokesman for the Super PAC says, no they are not premature in putting out an ad attacking Judd. "If you follow Kentucky politics a lot of air is being pumped into the Ashley Judd trial balloon," Collegio told ABC News. "We just took the opportunity to pin prick it a little bit." The ad is supposed run for a total cost of $10,000 in targeted ZIP code areas in the Bluegrass State. Judd is used to appearing in political ads, not being the target of one. During the election season, the award winning actress appeared with a cavalcade of other stars in online Obama for America Web ads endorsing the President for his 2012 election.